The Astronomer and I made an impromptu trip to Sin City this past October in search of food and fun to satisfy my wander-lusty ways and insatiable appetite. Vegas makes a great getaway because it is only four short hours away and hotel rooms are practically free! Since I am as risk adverse as they come in all manners of gambling, The Astronomer and I spent our days exploring food destinations on and off the strip and wandering the casinos people watching. We even fit in a Cirque du Soleil show at The Mirage—LOVE. We arrived in town late Thursday night, but didn’t eat our first meal until Friday afternoon. The number one restaurant on my list of places to try was Lotus of Siam. I can’t recall when I first heard about this off-the-strip gem, but the buzz surrounding the place continues to be immense and intense. 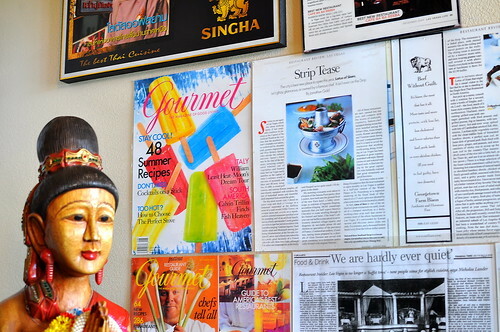 Upon walking into the restaurant, we were greeted by a wall of press clippings, including the August 2000 issue of Gourmet where Jonathan Gold proclaimed Lotus of Siam the “single best Thai restaurant in North America.” Pretty impressive for a joint located in a desolate and dusty Vegas strip mall, wouldn’t you say? 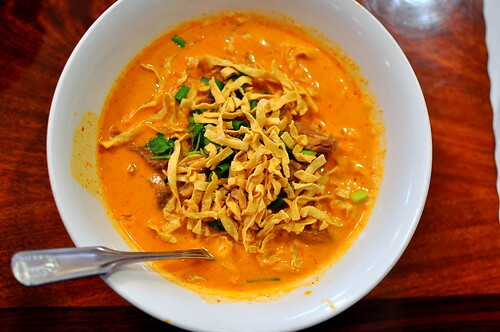 Lotus of Siam serves Northern Thai cuisine, which according to its website is “generally milder than those of Central and Northeastern Thailand.” It is influenced by neighboring countries including Myanmar, Laos, and China. 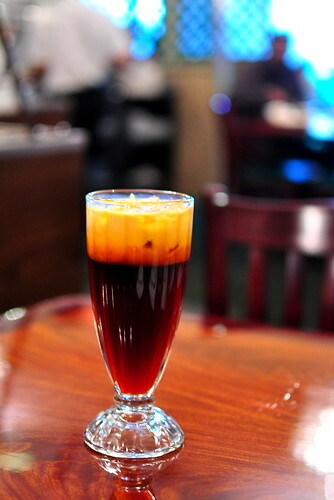 A Thai meal isn’t complete without a tall glass of sweet and milky iced tea to sip on. Our midday Northern Thai feast began with a unique rice dish called nam kao tod ($7.95). 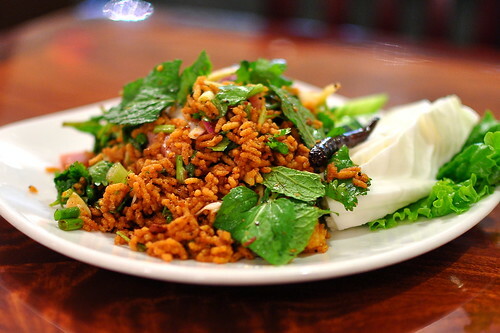 It consisted of deep-fried grains of jasmine rice mixed and matched with minced sour sausage, green onions, mint, fresh chili, ginger, peanuts, and plenty of lime juice. 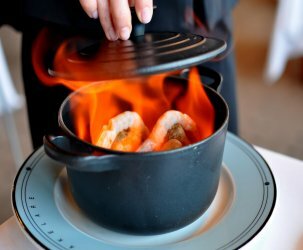 On a 10-point spicy scale, we ordered ours prepared a 6, which turned out to be just the right amount of heat for two kids who like to feel the burn. The nam kao tod was the freshest tasting deep-fried dish I’d ever encountered. I especially liked the crunchy grains and unabashed sourness. The Astronomer dug the strong citrus notes too, as well as the minty fresh garnish. 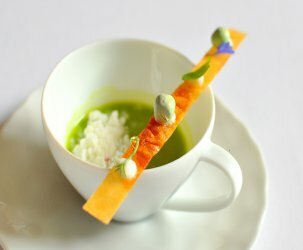 The next dish to arrive was the greatest thing that I ate on our trip. I ordered the drunken noodles with crispy duck ($20.95) based on an Ohio blogger’s recommendation that I randomly stumbled upon. He promised me a “life changing” experience, and sure enough, it was spectacular! We were warned by our waiter when we placed our order that the duck would be fatty, but what he failed to mention was that the skin would be taut and crisp, while the meat would be juicy as heck. 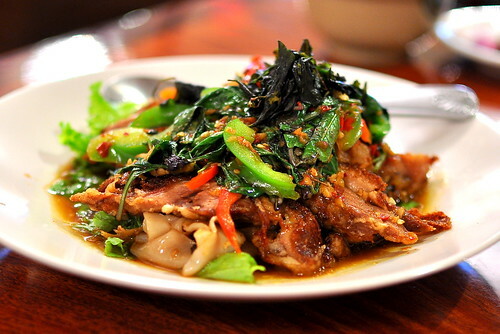 The goodness of the duck was further enhanced by the fresh chili sauce, fried Thai basil, and pan fried noodles. I didn’t need to reapply lip gloss after the meal thanks to the duck’s fatty sheen. Our final course was the beef khao soi noodles ($8.95), a Burmese-influenced dish comprised of curly egg noodles bathed in a curry and coconut cream sauce. It was topped with fresh green onions and crunchy egg noodles. 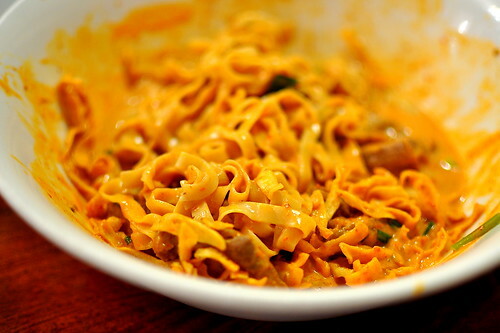 Here’s what the khao soi looked like once the sauce and noodles were well incorporated. The mild and creamy bowl was the perfect contrast to our otherwise sour and decadent spread. 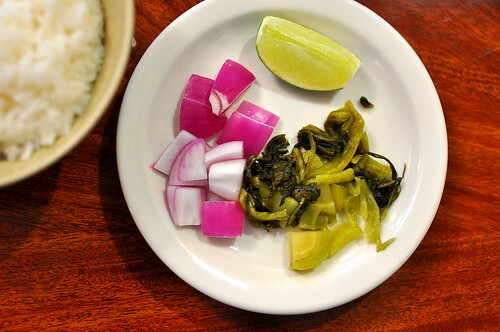 Pickled mustard greens, a lime wedge, and chopped red onions were on hand to curb some of the khao soi‘s richness. You are simply magnificent. Please return* to L.A. once you’ve properly settled down in Manhattan. Can’t wait to welcome you back! * Saipin Chutima, owner and chef of Lotus of Siam, operated Renu Nakorn in Norwalk in 1994 prior to departing for Las Vegas. I always tell people to come here! Such a “find” even though it’s become pretty mainstream..Chutima was even nominated for a James Beard award this past year. The drunken noodles are something special. great review!! omgosh,i’ve gone to vegas over 6 times this year and did not know about this place!!! what a big loss for me. can’t wait to try it next time! thanks. 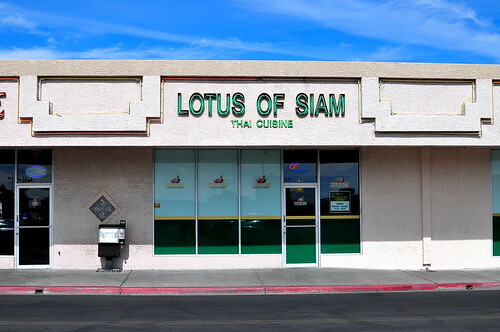 Derrick and I always pay a visit to Lotus of Siam when we are in Vegas. It’s so delicious!!! Those drunken noodles have my mouth watering like mad. A visit is definitely in order this December, I’m going to hit it up for a late lunch! oh so lovely! I love the fried rice ball salad, especially when it comes with the lettuce to roll up… everything sounded great, I love the colors of the condiments. Lucky you that vegas is so close by! I had the Khao Soi too – I absolutely loved its slightly rich texture & slightly sweet flavor, which melded wonderfully with just a squeeze of that lime and those mustard greens! I heard about this place a couple years ago but the past couple times I’ve been to Vegas I haven’t been able to convince my friends to check it out. I’m definitely going to insist before the next trip. So glad I read this review. 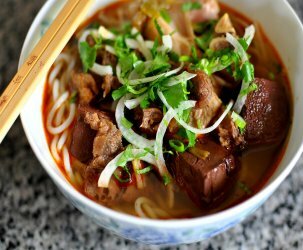 Can’t wait to try the beef noodles. Ended up at “Flavors” buffet instead. haha. Still going to try to hit this place up whenever I get to go again! Nice! flying in this Friday for the weekend. Going to have to check this place out. I normaly just head to the china town area and eat Korean or vietnamese food when I am off strip there. This is almost exactly what Justin and I ordered! I still dream of drunken noodles with crispy duck. I really think I ordered the wrong stuff on my two trips here. Ya, I’m going for the drunken noodles next time.